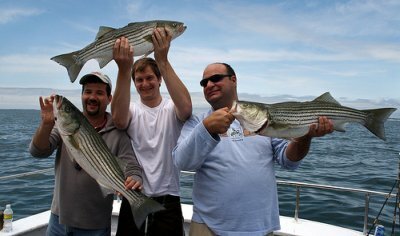 Looking through striped bass pictures proudly taken by other fishermen is often a great motivational outlet for striper anglers. Reading the exciting stories behind those photos provides a desire to head back out to that favorite fishing hole, or a well known hot spot, with the hopes of hooking into a big beautiful behemoth striper. And what better way of capturing that memorable moment than with a few photos of your own trophy catch, right? Moments like that last a lifetime. And you'll always be able to tell that story and be able to provide the proof, rather than it coming across as just another far fetched fish tale... "it was this big, I swear." 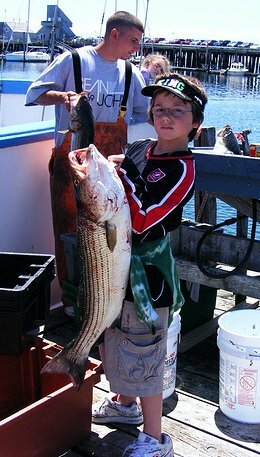 'Three Men And A Striper' - "Showing Off"
Young boy showing off a nice striped bass. Do you have any striped bass pics? A big one. Small one. Your first. A limit of stripers. Or just a cool moment out on the water? Your comments are welcome as well. Offer advice, additional tips and techniques. Anything positive that you wish to share. Share them here with our visitors and the rest of the world! We'll turn it into your very own web page. Brag and boast as much as you want, or remain modest. Invite your buddies to check it out so they can rate it and post their own comments too. Entering your story is easy to do. Just type!... Brag and boast as much as you'd like. Provide as many details as you want. Have fun with it! My Wife's First Striper Fishing Experience!